DoubleTree, part of the Hilton Family of Hotels, is a growing collection of accommodations in more than 150 cities. Thayer Lodging Group, based in Annapolis, Maryland is a privately held hotel investment company with a growing inventory of hotels including DoubleTree Palm Beach Gardens. DoubleTree Hotels offer unique, contemporary upscale accommodations and full-service facilities and amenities, including restaurants and lounges, room service, health clubs, business centers and extensive meeting and banquet space. Many of Thayer’s properties feature conference rooms and centers that meet the stringent certifications of the International Association of Conference Centers (IACC). These dedicated meeting facilities are custom-built to meet all IACC specifications for the most productive meetings, training sessions, and corporate retreats. "There is some value specifically for the superior STC rating that contributed to the IACC certification, which the owner will absolutely use as a competitive advantage." 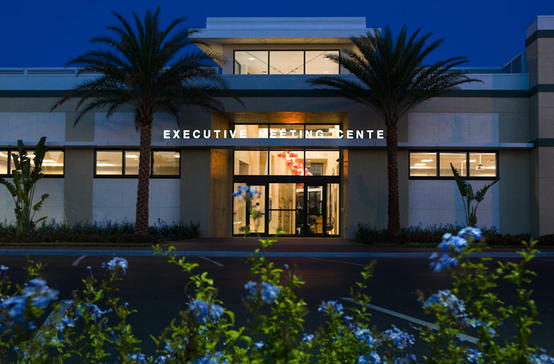 Gobbell Hays Partners, Inc. was tasked with building the new DoubleTree Executive Meeting Center in Palm Beach Gardens, Florida in compliance with the IACC standards, including a projected STC Rating between 50 and 60. This 15,000 sq ft. new construction includes teleconference rooms, event planner accommodations, convenient business center and lounge areas, and 7,500 net sq. ft. of flexible meeting space. “Thayer Lodging Group had very specific requirements that were established by the IACC. Our main acoustical design goal was to achieve an STC rating between 50-60 for fixed meeting room walls, but we also wanted to keep things simple and maximize usable floor area by implementing a single stud design. We felt the QuietRock® system would enable us to use a single stud system, providing cost savings to the client,” said Micah Padgett with Architectural firm Gobbell Hays Partners, Inc. Create an STC-rating of between 50 and 60 for fixed meeting room walls. Implement a single stud construction to save time and labor and maximize usable floor area. Obtain points toward LEED Silver Certification. PABCO® Gypsum’s Quiet® products allow Architects to design quality, quiet spaces in high-traffic, unpredictable, noisy and busy environments like hotels and resorts. A single sheet of QuietRock® is equivalent, acoustically, to eight sheets of standard drywall. Use of Quiet® products directly support sustainable zoning approaches to land use by reducing material use, thereby saving energy and reducing emissions. Gobbell Hays Partners, Inc. chose QuietRock® with Dietrich’s UltraSTEEL stud construction to build the quietest meeting rooms possible using a single stud construction. At the time of specification, QuietRock® was the only constrained layer damping (CLD) panel endorsed by Dietrich with independent third-party testing by Riverbank. The design created an opportunity to achieve a high STC rating using less material that contributed to the LEED Certification goal. An STC Rating of 55 using a single sheet of QuietRock® on one side of a single stud assembly. Faster implementation time than other soundproofing designs. Lower total cost than other soundproofing designs. Points towards LEED Certification. Based on LEED-NC, QuietRock® can potentially assist architects and designers in obtaining LEED Certification. About Gobbell Hays Partners, Inc.
Gobbell Hays Partners, Inc. (GHP), founded in 1977, is an architectural, engineering, and environmental consulting firm operating from offices in Nashville, Tennessee; Denver, Colorado; San Antonio, Texas; and Palm Beach Gardens, Florida. GHP has built a firm that successfully and synergistically integrates the skills of architects, engineers, industrial hygienists, and safety professionals. The talented team of architects, environmental engineers, industrial hygienists and other skilled professionals at Gobbell Hays Partners, Inc. are dedicated to creating safe, sustainable and aesthetically pleasing places to work and live.